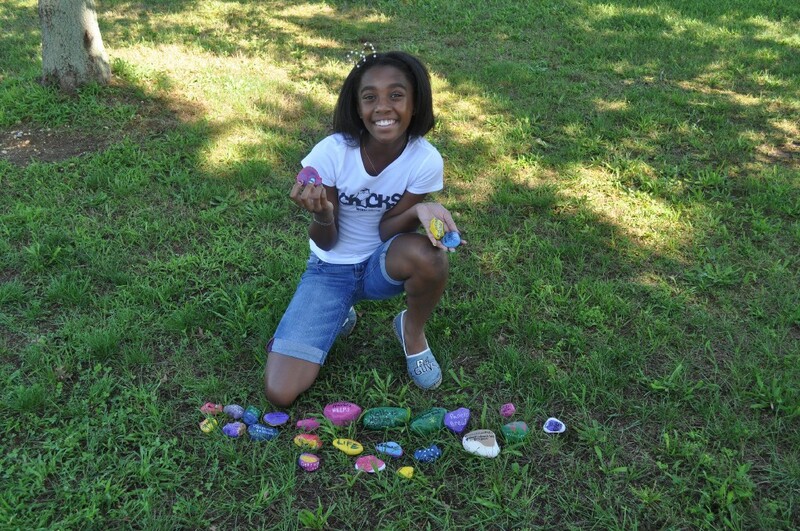 Kenikki Thompson, 11, aims to spread kindness throughout her hometown of Sicklerville through a project called Kindness Rocks, inviting residents to paint and hide rocks to share joy and inspiration to those who find them. Kenikki Thompson, 11, has always dreamt of being a superstar — a dancer, model and singer — but her true passion is community service, measuring success in the number of smiles put on people’s faces through her charity work. In 2015, when Kenikki heard of the water crisis in Flint, Mich., she organized a water drive in Sicklerville, receiving more than 2,000 cases of water, which her dad drove to deliver to the families in need. Since then, the Winslow Township School Six student has created numerous charity and community service projects throughout her hometown with the purpose of spreading joy and inspiring others to get involved with helping those less fortunate. Kenikki began an essay contest for the community, providing a theme or subject matter to write about and gifting the best essay a prize, such as a large dollhouse, for the most recent prompt, “What I’ve learned from playing with dolls.” Kenikki has also started a “Board Not Bored” game night, a Cookies for Charity program through Unforgotten Haven, a local nonprofit serving those in need and the homeless, as well as a monthly book club called The Page Turners. Most recently, Kenikki has created a township Kindness Rock project, calling all residents to paint rocks, hide them and explore the neighborhood to find others. Kenikki will be hosting an event in Frank Donio Memorial Park on Aug. 31, from 5:30 p.m. to approximately 8 p.m. for attendees to join in creating rocks for the community. Kenikki said participants should begin collecting rocks to paint and hide, and are welcome to bring their own blankets or chairs to use during the event. While some paint and brushes will be provided, Kenikki asks attendees, who are able, to bring their own supplies to share so the event will become more of a community effort. Those interested can sign up for the event on the “Winslow Township Rocks It” Facebook page, following the posted www.signupgenius.com link. Kenikki said the event has more than 50 people signed up, and she hopes to have a turnout of more than 200 residents. When rocks are found, Kenikki said, a photo should be taken and shared on Facebook with the hashtag “#WinTRocksIt” so those who hid the rock will see it was found. “Winslow is such a diverse community; there is some of everything here and we want everyone to get involved so it’s not just her project, it’s our project,” said Kenikki’s mother Nikki. Kenikki will be a keynote speaker at an upcoming Children’s Hospital of Philadelphia event, “CHOP Cares Tech Girls Conference,” in September, focusing on the interest of science, technology, engineering and math in young girls. Kenikki will speak to peers about how to get started in charity work and how to help the communities they live in.